This man, Dr. Jim Bloom, began moving one of his thumbs while in Neuro ICU and his diagnosis changed from complete SCI to incomplete C3-C5 without bilateral symmetry. 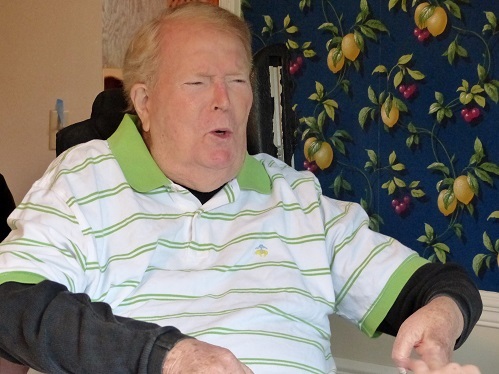 He moved from the hospital to an inpatient rehabilitation hospital and, nearly five months after his injury, home. 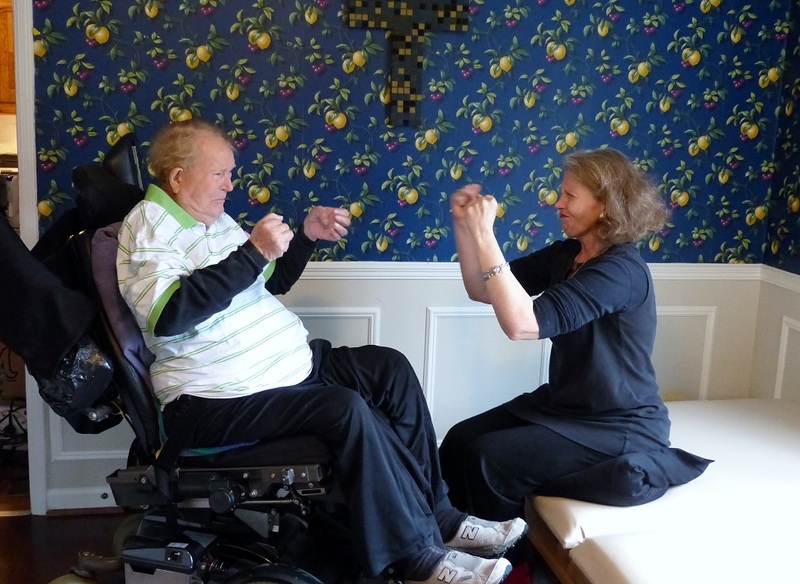 He continued outpatient physical and occupational therapy after moving home. After therapy, he came to Lakeshore Foundation in Birmingham, Alabama, for aquatic body work and land-based personal training. Dr. Bloom regained some strength in his upper body and his range of motion and dexterity improved. He made progress in strengthening his legs. Dr. Bloom and his family were 100% dedicated to improving his quality of life. Their dedication was paying off and he was progressing, but after 4 and 1/2 years Dr. Bloom’s motivation was waning and the work sometimes felt tedious. He was also experiencing some depression. What now? On a whim, Dr. Bloom’s son, Jim, asked me, Elizabeth Vander Kamp, aquatic specialist at Lakeshore Foundation, if I would be interested in giving his father acting lessons, as he had heard that I was an actor. “Yes, I would love to,” I replied. So in June of 2012, Dr. Bloom and I began meeting once a week for one hour in his home to act. You might be asking yourself, acting? What does acting have to do with rehabilitation? What does acting have to do with movement? What does acting have to do with strength and dexterity? As Dr. Bloom and I happily discovered, everything! Acting is living made large! Actors train their bodies, voices, imaginations, minds, and memories to reveal the human condition. They mine their hearts for emotional and sensorial memories. Actors experiment with movements attached to emotions. They try leading with emotion to discern if that changes the movement. They learn lines and become different people. They react to their fellow actors. In a word, actors are Alive! The first work Dr. Bloom and I did together is called the Mirror Exercise. Two people sit (or stand) facing each other, maintaining eye contact. One person is designated the leader and begins moving. The follower’s job is to move with the leader – as a mirror image. Then the follower becomes the leader and it begins again. 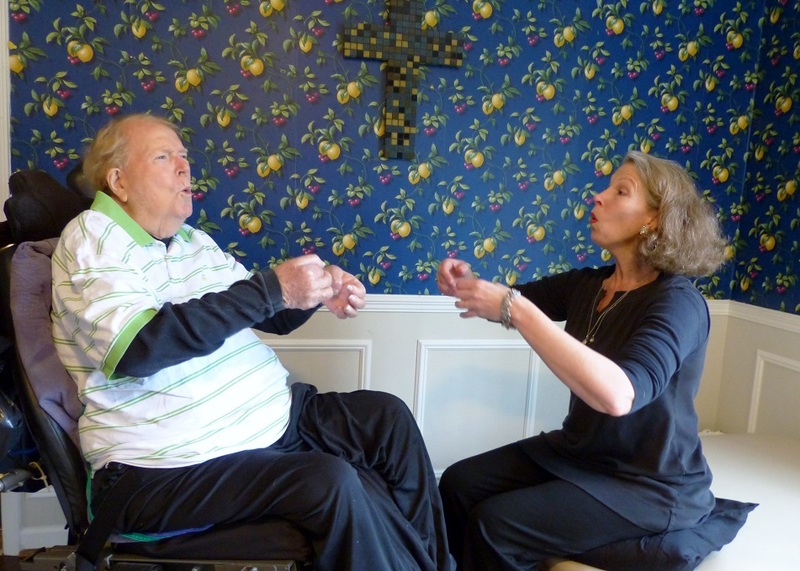 The benefits of this exercise are concentration, connection with the other person, and movement that is unexpected. In December of 2012, Dr. Bloom gave his first public performance in Shakespeare’s Hamlet. I played Gertrude, Hamlet’s mother. We found that Dr. Bloom is, in his own words, quite a “showoff.” His performance exuded confidence and vitality. His movements were strong and his voice clear. People asked how long he had been acting – “Surely you have done this before?” No, but plans are in the works another performance. This time Dr. Bloom will play the title role in Shakespeare’s Richard III. So, orthodontists can be actors? Yes! Stay tuned for more in this series on ACT2MOVE and MOVE2ACT! How wonderful! It warms the heart to see that you “pay it forward” so completely with your arts. Applause, applause! Elizabeth, this is wonderful news! Great work! What a great story! Keep it up. I miss you! What an amazing process for rehabilitation. Can we get some acting classes going at Lakeshore!!?? Elizabeth, the article is a beautiful story of the work that you and Dr. Bloom are doing. Dr. Bloom was a great Hamlet! Elizabeth, thank you for using your talents for God in helping to bring out the talent in my dad. Bravo!!! My dad the thespian… Who knew? It takes a great teacher to make a good student shine, and that you have done marvelously. Thank you! Elizabeth, great article and what a wonderful program! Thanks for sharing. This is beautiful work you are doing with Dr. Bloom. I enjoyed seeing the pictures. I can remember visiting Dr. Bloom not long after his accident and I was amazed to see him mirroring your movements! Thank you for sharing this story with others. Fabulous and moving story. And, as someone who has seen Elizabeth’s work as an actress, I think Dr. Bloom and anyone else who works with her, is so lucky! I hope to hear more about this application of acting techniques, and perhaps one day, Dr. Bloom’s Richard! Good for Dr. Bloom! Great article! Great job Dr Bloom! Never give up! This is wonderful, Elizabeth! I really enjoyed reading this – I did not know about Dr. Bloom and his story. Keep up the good work! Boy! This was very inspiring! Thanks so much for all your work and all the hope you’re scattering in our world! opened a new world to him ——– performance! Giving a new dimension and meaning to his life. Go Elizabeth! Elizabeth, I am an exceptional education teacher and I love this blog. I will pass on this blog site to all of my parents. What an incredible journey you had with Dr. Bloom- so beautiful. I do a lot of imitation techniques and games with my students with autism to help improve speech and make a connection. I am going to add in some of your acting techniques as well. I am always looking for new ideas. Thanks for sharing. L.C. Thank you for figuring out how to post a message! You Rock and I look forward to seeing you at Lakeshore soon! This is one of the BEST new things I’ve heard of that engages the artist within us all. Follow what you love, and the world will smile with you. Great job Dr. Bloom and Elizabeth Vander Kamp! What an amazing story! I didn’t realize that you (Elizabeth) are an actress, but with your personality and how fun you are in class, it is not surprising!!!! Thank you for all you do for The Splashers and everyone else you help. My hat’s off to Dr. Bloom!!! Elizabeth, you are truly a very caring person and have helped so many people. We all (Lakeshore Foundation members) really appreciate all you do to keep us motivated and moving. Keep up the great work you’re doing with Dr. Bloom and others!! !